So you’re all set for the festive season. You and your team have been planning this for weeks now - some of you have been planning for months. You're so prepared that you can now breathe, relax, and monitor your KPIs calmly while the busiest season of the year is off to a flying start. Have I got it right? Course not! We’re delighted to announce our first Shopify Flow action available to all Engagement Cloud for Shopify users: Add to marketing program. Every business process created in Shopify can be used as an entry point to a relevant Engagement Cloud program, ready to trigger a chain of marketing actions such as sending an email, triggered SMS, push notification, Facebook messenger, etc. In turn, this means you can better segment your customers, reward your most valuable segments or engage with them through an entirely different channel like Google Ads, Facebook or Instagram. Already syncing your Shopify Plus account with Engagement Cloud and a Flow user? 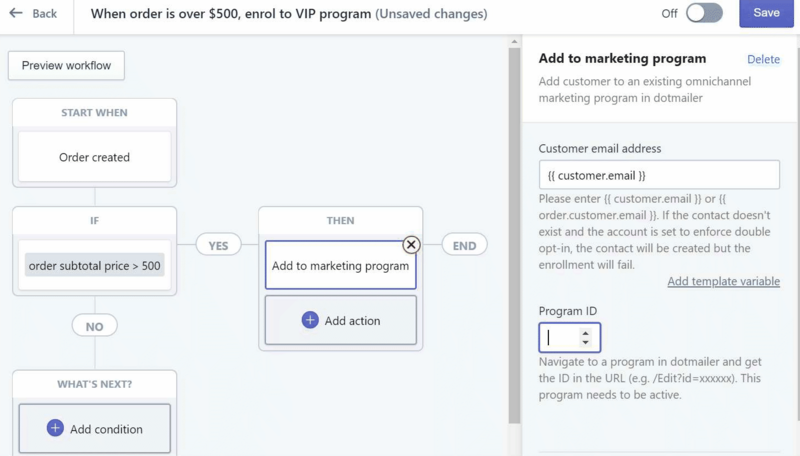 You’re good to go and will now see the Engagement Cloud connector appear as an action when creating a workflow. For more information on setting up your first workflow using the Engagement Cloud action, read our simple step-by-step guide here. If you’re syncing your Shopify Plus account with Engagement Cloud but not familiar with Flow – install the Shopify Flow app. Got a Shopify account but not syncing it with Engagement Cloud yet? Talk to us to learn more about the benefits of doing so.